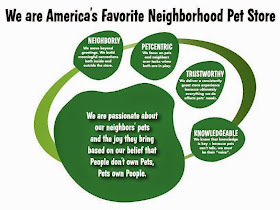 Pawsitive Impressions: Growl-free Returns Generate Loyal Neighbors! Check out this note from a neighbor in Ohio. Growl-free returns make neighbor engagement easy! Consistency creates a TRUSTWORTHY environment. I simply wanted to contact you regarding an excellent customer service experience I had at the Westlake and Wooster Ohio stores. As a new pet owner, I have been making frequent trips to the store for all of my puppies needs. That said, I purchased an Easy Walk harness about a month ago. However, this weekend the collar portion was believed to be defective and the seams split. I took it into the store explaining this and the customer service was excellent. The Westlake store didn’t have another one in stock, but said they would have more this Wednesday. I happened to be in the Wooster store this same day and asked there as well. I was allowed to make an even exchange, no questions, etc. I just wanted to praise the excellent and consistent processes with both stores. This is very refreshing as most places are a complete hassle to exchange anything. I will be a lifelong loyal customer because of this. I’ve always had great service each time I have shopped at Pet Supplies Plus. This is exactly what excellent customer service should be!